I shall be attending the excellent GallifreyOne convention in Los Angeles next month, 17th-19th February. 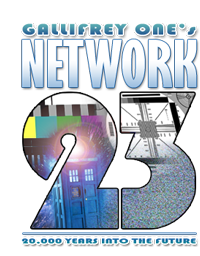 It’s the world’s largest and longest-running Doctor Who convention, with a fantastic range of guests, headlined by Eighth Doctor Paul McGann, plus other stars and production team representing the entire history of the show from1963 to the present day. I left it rather late to decide, but in the end could not resist — I haven’t been since 2009. The best fun of all is meeting folk from all over the place over an extended weekend event. And while I’m there, I hope to take part in some discussion panels. I’m also happy to talk about the new series of Blake’s 7 audios released during the month by Big Finish – if that’s not considered too infra dig by the attendees of what is ostensibly a Doctor Who convention. For more information about the convention, check out their website. And if you can’t attend, follow along the #gally tag on Twitter or see Facebook.